Thunder was born on the 1st June 2003 so he is just over 2 years old. He weighs 72lbs (32.6k), is inoculated, housetrained, loves playing, going out for walks, enjoys meeting people and other dogs. He is a lively, bouncy and happy dog. 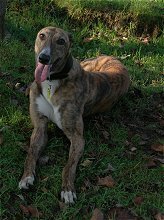 When Thunder first came into rescue he spent three or four weeks in emergency kennels, was fostered for a week with another fosterer then went to live with a couple and their 8 year old whippet/lurcher cross. The two dogs seemed okay to begin with but after about a fortnight Thunder accidentally bumped into the other dog whilst playing and from that point on the other dog started to tremble in Thunder's presence then became very wary of him. Apparently about a year ago the other dog almost died from an injury and we think the knock he received brought back the memories and placed him on his guard. No matter how his owners tried to bond the dogs together after that point it didn't work so after five weeks they sadly handed Thunder to us and asked if we could find him a new home. It was a very sad day for the couple and our hearts went out to them as they left him behind. When Thunder arrived he was very nervous, panted heavily and paced around the kitchen then went upstairs and urinated all over Bobby's bed. Whether he knew it was Bobby's or whether it was the first one he came to we don't know but he made such a mess and the duvet, which had been washed so many times before ended up in the dustbin as we didn't think it could stand another one. Thunder has been well looked after and has a lovely coat albeit very thick, which may be due to where he was living before coming into rescue. We've had to put Thunder on a lead and tie him to the kitchen table whilst we prepare his meals because he is very anxious, pants and paces so badly he gets in our way and disturbs the others by walking all over the top of them. In doing this he will come to realise that he will get fed and that at meal times he sits on the floor and waits patiently. We visited the local pub this evening and the first thing Thunder did was to jump up and place both front feet on the bar - it gave the landlord a bit of a surprise because of all the dogs we've had Thunder is the first one to have done this. Later on that evening he also tried jumping up to the pool table to see if he could get one of the balls. Thunder kept jumping on our bed yesterday making the duvet dirty as he usually did it following a visit to the garden. However, a few firm 'Off's' and a couple of cold water sprays seems to have done the trick as he's made no attempt to do the same again today. Thunder loves playing with Indi and Toby and their toys are scattered all over the house where they play with them. When Thunder arrived he came with a teddy bear, which when he's not cuddling up to he's throwing and chasing around. He also enjoys a good game of tug-o-war with the knotted rope or one of the soft toys, trouble is, he is so determined to win you'd be there all day if you didn't concede and let go. We think at some stage in Thunder's life he may have been hurt because if Stuart walks past him holding something he cowers away and looks at him in a strange way. Likewise, if Stuart moves suddenly he does the same. I can't say I've noticed him doing it around me. He's really good where food is concerned and shows no sign of wanting to jump up to the work surfaces to steal any, however, if something is left near the edge of the table and he can reach it with his tongue it's fair game, but if he's caught in the act a quiet 'no' to him is enough to make him stop. We left Thunder in the house with the others this evening whilst we went out for a meal and returned to a lovely welcome and no problems. We were a little concerned because we know he tends to whimper for a while if one of us goes out and he thinks he's on his own or if we both nip out in the garden we can hear him inside for a while until he realises neither Bobby nor Indi are bothered and he settles to his bed. We are really pleased with Thunder as he's made no attempt to get on our bed since the day after he arrived and we had to resort to a firm 'Off' and the cold water spray to deter him. Toby and Thunder are like two peas in a pod and where one goes the other is not far behind. They love running around the garden together and play fighting each other in the house, which usually causes Indi to join in and when she does it gets quite rowdy so we have to make sure it doesn't end in tears. They often sleep next to each other at night and Toby quite often climbs into Thunder's bed and cuddles up using him as a pillow - Thunder never bothers that Toby is asleep on top of him and it's lovely to see. Both Toby and Thunder think they are guard dogs because if they hear anyone coming down the drive or an unfamiliar noise they both bark quite heartily until they realise who it is or that there's nothing there. They both bark quite loud, which is strange as greyhounds are not often thought of as very good guard dogs but you can hear these two all over the house when they get going. The only other one we had that barked at noises like this was Squire - Indi and Bobby usually stay in their beds when all the commotion is going on and they must wonder what on earth all the fuss is about. Thunder is beginning to settle and we no longer get any more growls or snapping from Bobby or Indi as he wanders around the house. We are not sure the exact point this changed but it shows he is now accepted by them - and he knows the ground rules! As soon as the alarm goes off each morning he goes out to the garden with Stuart and Toby then comes bounding up the stairs, runs around the bed to say hello to me and get his morning greeting. His welcomes can be quite lively and often plays with his teeth, which sometimes results in a playful nip and, because not all people will appreciate it's play we have started a program to reduce this aspect of his playfulness by saying 'Don't bite' sharply when he nips us even though it doesn't hurt. This makes him stop what he's doing and he gives you a funny look as if to say 'what's the matter with you. I didn't hurt - it was play'. We visited a client today and was away most of the day so all the dogs came with us and Thunder travelled well in the car. During the afternoon we took them out for a walk to relieve themselves and they all 'did' with the exception of Toby. We put them back in the car then came back 15 minutes later and took Toby out again in the hopes he would do something this time. When Toby was out of the car Thunder suddenly started howling and we wondered if he wanted to get out as well. I wasn't there at the time so didn't hear it but Stuart said it was almost because he thought Toby was being taken away. When Thunder realised Toby was just wandering around he calmly stood by the window and watched. When Toby was back in the car he gave him a lick and they all settled down again. Over the past couple of days or so Thunder has begun casting his thick coat so this afternoon we gave him a really good brush with the rubber mit. We were quite surprised how much hair came out so we are going to brush him every day from now on until things settle down and his old coat has been shed. Thunder shows no sign of wanting to climb onto the settee and in the evenings he quite happily lays on the floor with Toby. He's really good on the house training front and we've had no accidents apart from the initial one where he urinated in one of the other dog's beds. He knows that when he's let out he has to empty and on this score he's very good. Thunder is turning into a really lovely dog as he's friendly with everyone and is now coming to us for cuddles. He will lay down if you say the words 'go down' whilst pressing his hind quarters towards the floor, however, if he's nervous he just springs back up again and each time you try to get him to go down after that it's harder - if he's not nervous it's easy and he stays there. He still gets very boisterous and excited when he first meets people and we have to becareful he doesn't jump up at them. He gets very excited when we approach other dogs because he wants to say hello to them. He also gets very excited as we are getting ready to go out for walks and when his meals are being prepared - but then this is probably because he's a young happy dog. If Thunder gets nervous or anxious about something he pants heavily and paces the floor so he displays easy warning signs that he feels unsure of the situation. 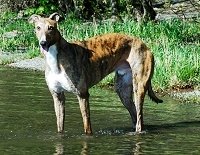 This morning Toby went to his new home and his new owners took him for a walk with their greyhound. As we were pulling away in the car Thunder became very anxious at leaving him and whimpered for a while before laying down in the back of the car till we got home. Upon arriving home he paced the floor for a couple of hours whimpering and no matter what we did he wouldn't settle. I've often found that if a dog behaves like this if I go to my office and do work quietly at my desk the dog settles better - it worked again for Thunder because he soon settled to sleep on the carpet outside my office door. Thunder got on so well with Toby we half thought something like this might happen so he will need a little extra TLC to help him get over it. Part of the day today involved a dog handling training day when Kevin and Kath Wilson from Bay Dog Training did a session for people involved with Dumfriesshire Greyhound Rescue and as fosterers we attended. Thunder was fine in the car and quite happy until all the other dogs and their owners arrived. Inside the hall he became very anxious every time one of three dogs barked, which resulted in him joining in and pacing the floor. In the end we thought it best to put him back in the car, which we did and brought Tara from the car into the hall. This morning we started Thunder on a course of Scullcap and Valerian tablets - some herbal tablets, which should hopefully reduce the anxieties that have been brought to our attention the past few days, which came to head on the training day. He will be on 10 a day to start with due to his weight and we will see how he gets on. Thunder started playing with Bobby and Indi today. He was much better in the pub this evening - the best he's been, which maybe because as people came in we let him go and say hello to them rather than keeping him back. Once he said hello he settled much quicker. Despite what we said earlier about Thunder not wanting to get on the settee since Toby went to his new home we can't keep him off it. He's chosen half the double settee and sits with his front legs crossed over the arm. If he lays full length on the settee and Stuart comes over to sit there he moves up for him by crawling along it until he's on his half - even without having to ask him. He's also taken a fancy to my armchair, which he loves curling into. Thunder is much happier now he's settled down to life without Toby and Tara but does miss running round the garden, which he did at every opportunity. Indi plays with him but it's not the same because she's not into racing round a mud track, which my garden has become. Visited a home this morning where there was a 2 year old child. The little boy got on the floor and played with his toys around Thunder's feet. It was the first time he'd been so close to such a young child and he was so gentle, never bothered about the toy cars around him or the little boy crawling so close to him - we felt very proud because it showed a very gentle side to him. Went to the vets today for his inoculation. He was quite anxious in the waiting room and was pacing, panting and barking at the other dogs. Thunder is a very friendly dog and sometimes I think his anxiety stems from not being allowed to say hello to the other dogs when he wants to. When he's pacing and because he is a big strong dog some people may think this is aggressive behaviour when it isn't and I explained this whilst I got him to lay down and be quiet. Thunder thought he was in heaven yesterday when Dixie and Daisy arrived to stay overnight with two more friends to play with. Many a time during their afternoon walk he was seen walking side by side with Daisy. Visited Mum again today and this time Thunder quickly settled. Kanga came to stay a couple of days and Thunder got on really well with him and they went everywhere together. We even found them in the same bed this afternoon. Thunder is also much more relaxed these days and now allows us to cuddle him more as he's beginning to realise it's nice. Today was the annual Dumfriesshire Greyhound Rescue Fun Greyhound Show and Christmas Fayre at the Loreburn Hall in Dumfries and we all drove up to attend where put up a stall selling the 'Long Legged Beauties' 2006 calendars. Becky Speed (July) and Britney-Lee (October) joined us to meet the press and sign calendars and Kanga's owners kindly looked after Thunder for us during the day, for which we were very grateful. A family at the hall seemed quite interested in Thunder but thought he was a little too boisterous for them. Having said that, considering what he was like two weeks ago at the training day he was very, very good considering. He was bound to be nervous and to begin with every time a dog barked he barked as well but this soon stopped when he was shown the water spray a few times. He enjoyed the hustle and bustle of the hall as there were so many people and dogs for him to say hello to, which wasn't always possible and this upset him a bit and, on top of all that he wasn't with us, however, its all good experience and will have done him good. It was really lovely to see our seven foster dogs with their new owners and seeing them all together brought a lump to my throat and really made our day. When we arrived home Thunder lay on the settee in between (and on top of) Becky Speed and her partner who were staying over night in readiness to do Thunder's calendar photo shoot tomorrow. Went for a day out to Coniston Lake with Becky and did Thunder's calendar shot for next year's calendar. The day started very, very foggy but as this lifted throughout the morning it turned into a glorious day. Thunder has been to so many places, seen so many people and been involved with so many new experiences since he came to us that we think he is beginning to realise that things do happen around him and at the end of the day he's still okay. Thunder is much more confident and plays happily with Bobby and Indi who have accepted him as part of the family and if a plate is put on the floor to lick all three heads go in together and none of them hang back. Thunder is getting much better and a day doesn't go by now without seeing an improvement of some sort in him. Thunder is proving to be a really good guard dog as he will bark if he hears an unusual noise or when people ring the door bell, but when he sees who's at the door it's a happy dog who's wagging his tail that greets the visitor. Thunder often has no collar on in the house and he enjoys the freedom it entails. He loves sitting on the settee, playing rough and tumble with us and rarely nips or bites when he plays as he used to do. He understands 'don't bite' and as soon as he hears the phrase he stops what he's doing and looks at you with sad eyes saying 'sorry'. He cuddles into us for a cuddle rather than pulling away from us as he used to. He's turning into a wonderful dog, which I thought I would never hear myself saying after the difficult start we had and the incident when he chewed the seat belts in the car at the training day earlier in the month. Thunder had his second inoculation this morning and was much more calm in the vets. He has been so much better since we put him on the Scullcap and Valerian tablets so we decided to reduced his dose to 8 a day. We will keep him on this until the container is empty then see how he is without them. Danny escaped through Stuart's legs as he was going out the house and the surprise allowed Indi and Thunder to follow. Danny went out the drive into next door's garden but Indi and Thunder realised it was wrong and half way down the drive turned round and came back in the house. Danny loves being in our garden and is sometimes quite difficult to get back in as he enjoys watching the passing traffic and sniffing around. This afternoon I let both him and Thunder out to do what was necessary. Thunder had finished and was patiently standing by my side as I was calling Danny. Danny just ignored me and Thunder started looking up at me then at Danny so I said to him 'I suppose I will have to go and get him' To my surprise he suddenly ran up the garden as if to play with Danny and my immediate thought was 'Oh no, now I have two to get in'. However, to my astonishment when Thunder reached Danny he did a little dance in front of him enticing him to play and get his attention, then he ran down the garden, down the steps, round the pond and into the conservatory with Danny following him. Thunder then stood in the doorway blocking the exit and looked at me as if to say 'that's how you get him in'. Thunder really is a very intelligent dog and I was so proud of him. what this 'present thing' is!
. . . finding the knack!
. . . got it!
. . . all feet in the air . . .
Whoops, better jump that mole hill!
. . . and off again . . . .
. . . and the shot itself. hours. Thunder thought him wonderful and lay on the settee next to him, gave him a lick and rested his head on Mark's lap. Despite Mark being a little rough with him and saying 'bye bye' when his face was licked and pushing him away Thunder showed no concern and continued laying next to him. We took Thunder off the Scullcap and Valarian tablets today so we shall see how he gets on without them. Because Thunder was quite boisterous when he first met people we started using a routine of no eye or physical contact and used the word 'wait' until all four feet are on the floor. When they are we then say hello to him. We are also asking other people to do this as well but it's not always that easy, however, each time we do it he becomes quiet quicker each time. We are also doing it when he gets too bouncy as we try and put his coat, collar or lead on. It's certainly working but we have a way to go yet. We have also started a 5, 4, 3, 2, 1 second sniff routine when he meets other dogs. This first week he's allowed to sniff other dogs for 5 seconds, next week he's only allowed 4 seconds and so on until we get it down to just a one second sniff so he learns to sniff other dogs and walk on rather than become too over powering. Thunder never made the SADD (Save a Dumfries Dog) walk around Dumfries this morning because we only got as far as Southwaite Service Station when we all had to get a lift back home on a vehicle recovery lorry care of the RAC - the cambelt tension arm had become loose and started making a loud noise as we were leaving the filling station. A member of DGR drove from Dumfries to the service station and collected Danny because he was going to his new home today and Bobby, Indi and Thunder came home in our car on the back of the recovery vehicle. Thunder was very good and took the whole experience in his stride. Later in the day he stayed home with the others whilst we took Stuart's car to Tebay Services where we met another DGR member bringing us Tina and Prince. Thunder is no problem being left with the others and gave the new dogs a lovely welcome when they arrived. After Tina went to her new home we had tea he crashed out on the settee for the rest of the evening. Thunder has been 'supervising' Prince as he's been touring the garden and looked most concerned when Prince pushed the gate at the bottom of the garden sufficient to get through onto the bank at the entrance to our field. Thunder stood there prancing about as if to say you are not suppose to do that and looked a lot happier when we brought him back in the garden. We visited the pub this afternoon with a friend and Thunder did us proud - he was very excited when he first arrived because Zak, the pub dog was there and he wanted to say hello but after that he just settled on the floor with Bobby and Indi and was as good as gold despite it being busy - amazing what happens when a foster dog is no longer 'the new boy'! This evening in the pub someone came in with a six month old terrier pup and all the dogs jumped to their feet immediately to greet the new arrival. The pup boldly ran in between the greyhounds wanting to play. Indi danced around the pup trying to get it to play with her, Thunder and Prince, who were on leads, were really good because the pup jumped up resting its front feet on their shoulders and running around between their legs. We were a little concerned that Thunder might be too boisterous with it being so small but he recognised it as a pup and was just keen to sniff and have a play. The pup had endless energy so her owner put her on his lap to give our dogs the peace to lay down and relax again and we were pleased with how Thunder handled the small and bouncy pup. When we gave Thunder his Christmas present this morning he held the wrapped package in his mouth not quite sure what to do when he noticed Indi with hers. She lay it on the floor, put one foot on it and started ripping the paper off with her teeth until she could reach the toy, pull it out, shake it and run upstairs to her bed with it. Thunder stood with his present in his mouth watching all this then he lay his on the floor and did exactly the same but instead of running upstairs he lay on the carpet and played with it a while. He's a very quick learner because later Stuart was eating some Pistachio nuts and saving those he couldn't open for Indi who loves crunching them to pieces. Stuart gave one to Thunder who rolled it around his mouth and dropped it on the floor then stood watching Indi crunching hers. After she'd eaten it and came looking for another Thunder picked his up, rolled it around his mouth and began crunching it till it was gone - he's a very intelligent dog! This afternoon we let Thunder off the lead with Indi and Bobby in a small enclosed field near our house. We haven't been able to let him off before because there have been sheep and horses in the nature reserve and all the fields around us. He loved the freedom and came running back to us when we called his name, which we were pleased with. He ran and played with the others for about fifteen minutes before getting out of breath and sedately walking back home. Taken Thunder in the field again a few times over the past few days and now he gently runs around with the others and will do perhaps one fast burst an that's it. That tight 'coiled spring' let loose on Boxing Day doesn't seem to be quite as tight now so we feel we can let him off a little bit more as we find other suitably enclosed areas. Over the past couple of weeks we've been teaching Thunder the command 'wait'. This is because when he first arrived he was quite excitable when he greeted you, wouldn't stand still to have his collar, lead and coat put on and danced all over the place as we carried his dinner into the conservatory for him. In all these instances we are using the command 'wait' to make him keep all four feet on the floor and wait patiently for whatever we are doing. It's beginning to pay off because he tends not to jump up at people quite the same, will stand still (once he's been told) whilst we put his collar, coat and lead on although he hasn't yet realised he also needs to stand still whilst we tie the tapes to stop his coat falling off him. Although he still gets excited at meal times (it's the good dinner we make him!) if I stand still he will stand still by my side and wait - the trip to the conservatory is, therefore, a bit stop, start, stop, start at the moment but the number of steps before each stop is increasing. Today Thunder spent the afternoon with a family who are thinking of re-homing him to see how they get on with him and him with them. When they arrived to pick him up he happily jumped in the back of their car in between the children and when he arrived back they said all had been well and could they have him again at the weekend for a bit longer. We took Thunder to his potential new owners this morning for the day taking with him his bed and coat etc. If all goes well during the day he will stop-over and come home sometime tomorrow. The house seemed empty without Thunder last night and this morning as I was getting my Crunchie Nut Cornflakes I picked one out as usual to give him only to realise he wasn't by my side waiting for it - it felt strange. Mid morning we phoned to see how he'd got on last night to find he had slept on their settee all night and had been fine, so much so, they decided they wanted to re-home him and, rather than bring him back to us only to leave again in a few days could he just stay. A tear came to my eye when I heard this but we made arrangements to bring him his toys and a new bed, coat, collar and lead over that evening and complete all the paperwork. When we called during the evening with all his things he was downstairs in the bar waiting for us. Yes in the bar, for Thunder has gone to live with a family who own a pub with letting bedrooms. Over the weekend he has been going into the bar on his lead during quiet times to be introduced to the customers and staff - and he was loving it. We had warned that because he is such a friendly dog he often wants to jump up at people although since learning he may be going to a pub we have been teaching him not to do this and weren't sure if he was going to remember what we had been trying to teach him. We were really proud of him when we were told he hasn't jumped up to anyone and just walks up to them and waits to be stroked. His new owners are also teaching him that when he comes down the stairs from the flat he must turn right at the bottom to go into the bar and never left, which leads into the kitchen and restaurant. Once in the main bar, he mustn't go into the restaurant area or near the main door leading outside, however, if he wants out he goes through the door into the corridor and out the door there. Called in this evening to do Thunder's follow-up visit and found him asleep on the settee. When he saw us he jumped of and gave us a lovely welcome. His new owners say he has settled well and feels part of the family. They have use of a secure field up the road where he's allowed off the lead. He sometimes sleeps on his young owner's bed and when he does she covers him up with the duvet and puts his head on a pillow! When the bar is open and it's quiet he visits the staff and is getting to know the customers. He still has his lead on in the bar at present because it's still early days and he's booked in for a training course with Bay Dog Training commencing on the 1st March so he can be taught how to be a good 'pub dog'! A new beer garden is being made and the Chef makes him his own special treats. The pub is apparently haunted and a man supposedly sits on a particular seat in the bar. At times when Thunder is in the bar if he's in the vicinity of the seat he sometimes backs away from it or scuttles past it and whimpers so his new owners think he can sense the ghosts' presence at times. Thunder looked really well and happy and very alert as to everything going on around him and we were so pleased to see him so settled. This morning Thunder came to stay a few days whilst his owners went away on holiday as they thought putting him in kennels might upset him. As his new home isn't far from us and he lives in a pub we've been able to see him a few times since we did his follow up visit and once we saw him at his training class when we started taking Lester for socialisation training. When Thunder arrived last week he whimpered for the first couple of days or so and seemed quite unsure as to why he was back with us. We did a calendar photo shoot with him at Arnside the day after he arrived, which he seemed to enjoy and by the end of the third day he was much more settled in and around the house, playing with Jack in the garden and in the evening we found him laying over the arm of the settee cross legged as he used to do, looking much more himself. Seeing him in his usual position on the settee was lovely to see and from that point on he seemed much more settled with the others and happily helped Jack guard the house by barking at every sound they heard - hopeless having a 'lie in', even for a few minutes for the two of them were up and barking at every noise they heard. When his owners arrived this morning to collect him he gave them a lovely welcome, happily jumped into the back of their car and lay on his bed waiting to go home. whilst walking around the Nature Reserve, which he enjoyed and in the evening he was up in his usual place on the settee with legs crossed hanging over the edge looking as if he'd never been away - the other foster dogs looked at him as if to say - well, you're cheeky getting up there so soon, we daren't yet because Bobby might tell us off. This morning Thunder came with us for the day so we could take some photographs of him for the 2008 calendars. It was a lovely day so we did some paddling pictures of him in Coniston Lake because he loved walking in the water to cool off. From there we went to the saltmarshes at Flookburgh where he posed for a health and safety shot with a model under the heading 'danger quicksand' - there was no quicksand where we were but the sand was by no means soft and fluffy. By the time we finished only Thunder was clean - everyone else was covered in mucky sand, which seemed to get everywhere! Having finished we all went home to clean up and feed the dogs including Thunder as it was getting late. Think Thunder enjoyed his day out but was probably glad of his bed when he got back home. This morning Thunder arrived to stay till the end of the week as his owners were going away and couldn't get him in the kennels he normally goes to. Although he knew where he was when the car pulled up and he enjoyed meeting the others he became quite anxious and wimpered for his owners when they left. This anxiety lasted most of the day but he latched onto Pudsey, which helped him. Thunder was quite anxious for the first twenty four hours as he was the last time he stayed and apparently does in the kennels because he misses his owners but after that he settled down and latched on to Pudsey. The two of them went everywhere together enjoying each others company when playing with toys and running round the garden - we nicknamed them the 'gruesome twosome'. Thunder was pleased to see his owners when they came for him but Pudsey went a bit quiet for a while afterwards, which is understandable as he'd lost his 'shadow'. Thunder has new playmates - two hampsters that he sniffs in the cage and watches as they roll along inside their balls across the living room floor. His owners say Thunder shows no interest in trying to catch them but just watches them with amazement! Thunder and his family are leaving the Crown Inn at High Newton today to take up residence of a pub on the outskirts of Blackpool and Lytham St. Annes. We wish them all the best with their new venture but it will seem strange visiting the Crown in the future knowing he's not there. Our Christmas card sent to Thunder and his owners was sadly returned by the post office as 'no longer at this address'. We made a few enquiries as to where he may now be living but with no success. If Thunder's owners or anyone who knows Thunder's owner knows of their whereabouts we would love to know so we can ask how Thunder is getting on - we hope he is keeping well and enjoying life.